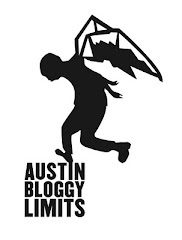 AustinBloggyLimits - An Austin Music Blog: Markov/Zlam Dunk at Red 7 Fo Free! Now y'all know that I love free stuff and you know I love Markov, well tomorrow night those two loves combine! 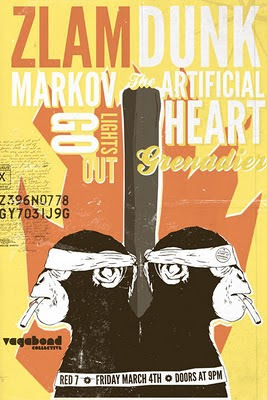 That's right you can catch local, post-rock outfit Markov at Red 7 and all it will cost you is your physical presence! Not only that, but in addition to Markov, you can also catch a set from another local, Bloggy-fav, in the form of Zlam Dunk. I'd like to take credit for this unholy alliance of bad-assedness as I introduced a member of Markov to a member of Zlam Dunk, although in reality they already had a show booked together at that point, but for creating-my-own-reality reasons I'm still going to take credit. Red 7's doors will open at 9:00p Friday night for this event and as you can see on that handy/cool-looking poster you can expect to see FIVE bands performing, so I'd expect the music to begin by 9:30 at the latest. I'm not, precisely, sure about who is playing when but I'd expect my homeboys from Markov to start slaying shortly before midnight with Zlam Dunk taking the headlining slot around 1am. I haven't seen these other bands perform before but the links I posted above are to Bandcamp and MySpace pages, so you can hear and/or download music from them there. Here's an older video of Zlam Dunk to tide you over until tomorrow night.